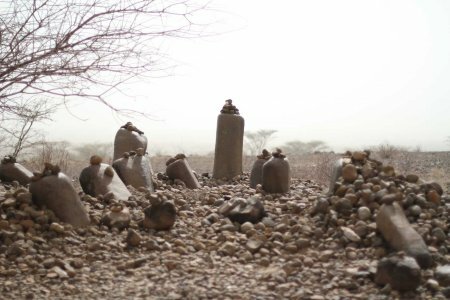 Sometime in the last few thousand years, a group of people who lived in the Turkana Basin erected a series of large stone pillars, also known as megalithic structures, underneath which they buried their dead. Though the people are gone, the structures remain remain behind them, and are a source of wonder to the Turkana people and to Archaeologists in the Basin. The Turkana call these pillars “Namorutunga,” or people of stone. Though they did not build them, past researchers have noted that symbols on some Namorutunga resemble those used by Turkana pastoralists. To investigate, Veronica Waweru led students to Namorutunga sites to see the these remains and reflect upon their history. Kalokol Namoratunga emerge from the haze of a duststorm, north of the Turkwel river in west Lake Turkana. TBI field school students began their trip to see the Namorutunga by traveling to visit a local elder and wise man named Eporon. 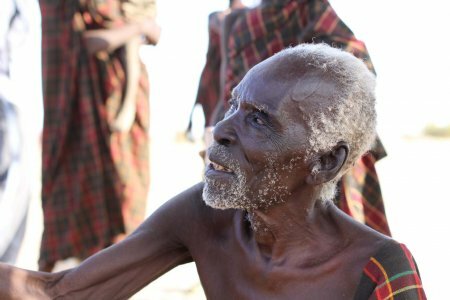 With the help of field school staff, students learned that Eporon had witnessed dramatic ecological and cultural changes during the course of his life in south Turkwel, beginning in 1929. Students were rapt by his stories, and remembered his words as they set out for local Namorutunga sites north and south of camp. Lothagam, which the students visited previously, is home to a series of stone pillars and was visited by students first. Students later traveled north to Kalokol, to see even more spectacular pillar sites found there, and to better appreciate the diversity of these sites found throughout the basin. 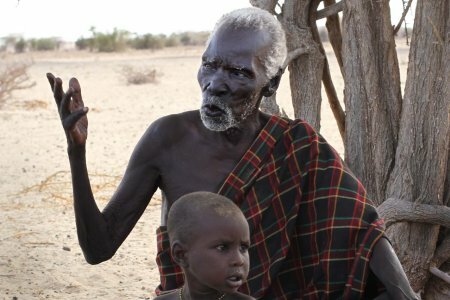 Eporon and his grandchild outside their home in south Turkwel. Eporon was born in 1929, and remembers hearing about the struggles of World War II as a boy. He was hired by the British to help guard Kenyatta during the Kenyan leader’s highly publicized trial in the early 1950’s, and has borne witness to Turkana’s history in the years since independence. Students were amazed to learn from Eporon that the land around TBI had once been lush with grass, thickets, and animals including giraffes, elephants and ostrich. A man of moderate wealth during those times, he said, might easily own 200 camels. Today, however, the ground is barren, and many Turkana struggle to survive with far smaller flocks. Eporon tells students of the Namorutunga. As Ikal, Emmekui and Ekeno translated, Eporon explained that the Turkana have a story fir the origin of the stone pillars found at Lokori, Kalokol, Lothagam and elsewhere. Two groups of people met one night, he said, to participate in the Edonga, or night dance. One group of people were locals, Ngikilopek akwap, while the others were visitors called Ngipeyok. When the locals had danced, one visitor stood up and asked if he could dance. His song was different from those of the others, he apologized, and he asked if the locals would be kind and not laugh at him. They would not laugh, they promised! And so he began to dance. The song of the visitor, his Emong, was very strange and as the local people watched they could not help themselves from laughing. So one by one they began to tumble over in laughter, and as they did so they turned to stone, Namorutunga. When people pass Namorutunga today they place pebbles on the pillars for good luck, showing respect for the people of stone, whom some believe are still present in the rocks. Quan and local guide James lead the TBI students and staff in the dry Nawata streambed at Lothagam, West Turkana. 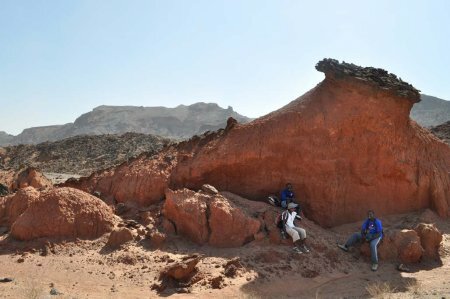 The Galana Boi geological formation was formed in the last 10,000 years by lakebed sand and shell packstone layers, deposited when Lake Turkana was far higher than it is today. People living on the lake shore during this time, called the Holocene by scientists, made pottery, stone tools and bone harpoons that can still be found in the sediments. Hoping to reach these archaeological remains, TBI students moved south along the Nawata streambeds, with Lothagam’s high hills rising on either side. Anakoli, Mary and Johnpius sit beneath a sandstone column rising above dry streambeds, within the lower Nawata member of the Nawata formation. Students were looking for Holocene lakebed deposits, but to reach these they had to walk along a contemporary stream bed that has eroded through sand and sandstone layers 7-8 million years old. 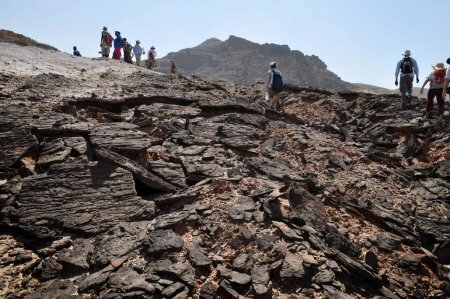 Students climb up black sandstone plates that have crumbled as the result of erosion. An abandoned homestead leaves little trace of habitation only a few years after its owners sought new pasture. 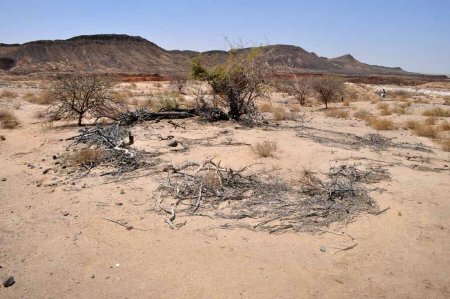 A far more recent site of occupation, this Turkana homestead is now abandoned, leaving only a ring of brush, a few stones and burned charcoal where once were huts, people and their herds. Such abandoned structures quickly become a part of the wilderness of the landscape. Holocene and Miocene sediments atop one another at Lothagam. White, gray and beige sediments formed in during the Holocene, when the lake was at high stand, rest above far older sand, mud and siltstones laid down by an ancient river system 6-8 million years ago. Marsha and Ebba, visiting archaeologists from Sweden, pause while walking up the Nawata streambed at Lothagam. 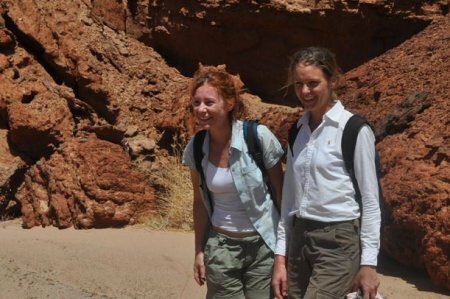 Marsha and Ebba, archaeologists from Sweden, joined the Turkana Basin Institute for 2 weeks and traveled with students to major archaeological or paleontological sites across the basin. 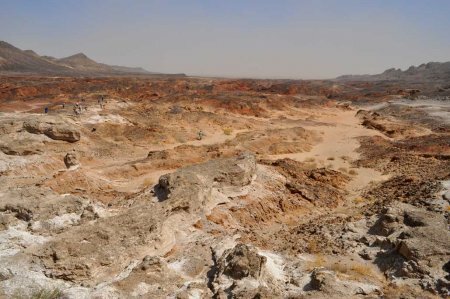 Trained in classical archaeology in Italy and Greece, they hoped to learn whether students of archaeology in Europe might one day be able to study sites in East Africa as well. Burial sites above Galana Boi deposits at Lothagam. 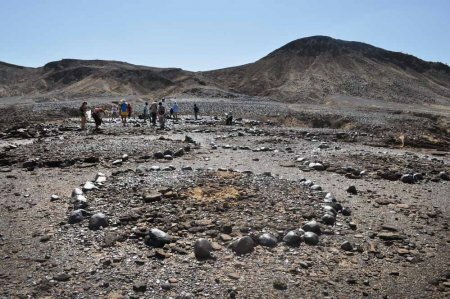 These circular platforms, sometimes accompanied by pillars and sometimes not, are found at some sites East and West of Lake Turkana and are thought to hold the remains of an ancient pastoral people. The burials here at Lothagam are highly decorated by incricate pottery shards, and accompanied by Namorutunga pillars. 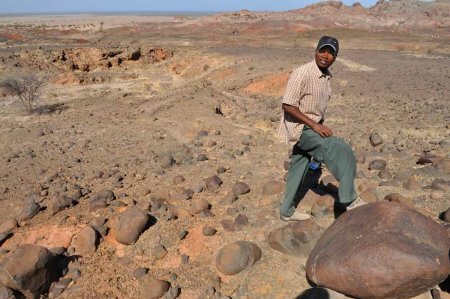 Timothy Ngundo, TBI fossil preparator, finds a massive basalt boulder outside the Namorutunga site at Lothagam. Timothy is a bone and fossil preparator at TBI South Turkwel, and an expert in the identification of recent or ancient animal remains. 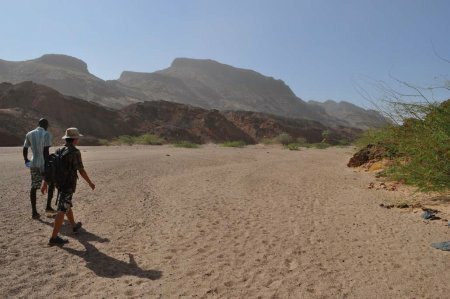 Namorutunga at Kalokol, north of the Turkwel river, loom from the dust of a sandstorm blowing across the desert from the East. After visiting Lothagam, students traveled to the pillar site farther north, at Kalokol. The site is adjacent to a small highway, one of the only roads north of Lodwar, and TBI students and staff were dismayed to find that some of the burials had been plundered. These sites are beautiful and mysterious, but while made of stone, they are nevertheless fragile and may vanish if left unprotected.